When you walk around the newly expanded Considine Professional Building on the Akron Children’s downtown campus, expect to see some familiar territory. The building’s interior floors are each themed with artwork and photography that give off a hometown vibe. Welcoming patient families to Level 6 with a theme of “Transportation” is Cohen Harper posed on the All American Soap Box Derby track in Akron. 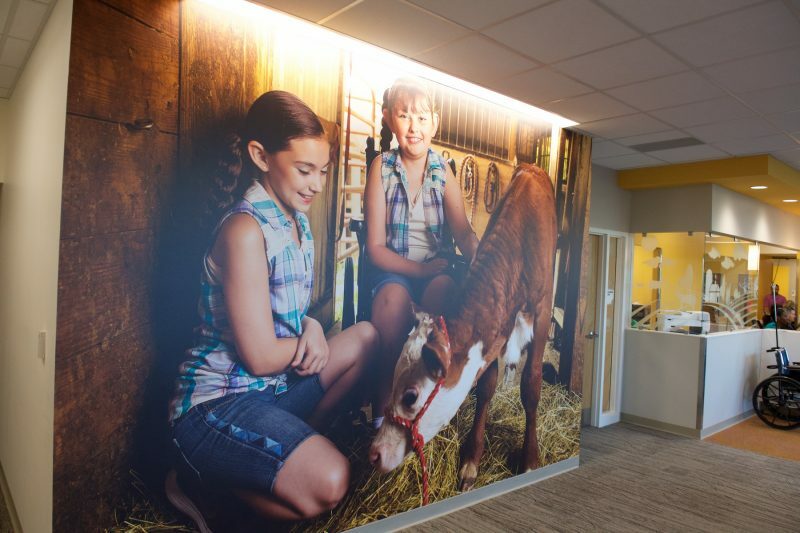 With a baby cow on a farm in Suffield, patients and sisters Kendal and Makenzie Yovanovich are featured on a countryside mural. The larger-than-life wall set the “Animals” theme for in the waiting area of the NeuroDevelopmental Science Center on Level 4. Robin went to places like local public parks for photo shoots designed around the themes of water fun, parks, animals, the countryside, playgrounds, transportation and sports for art in the public spaces. 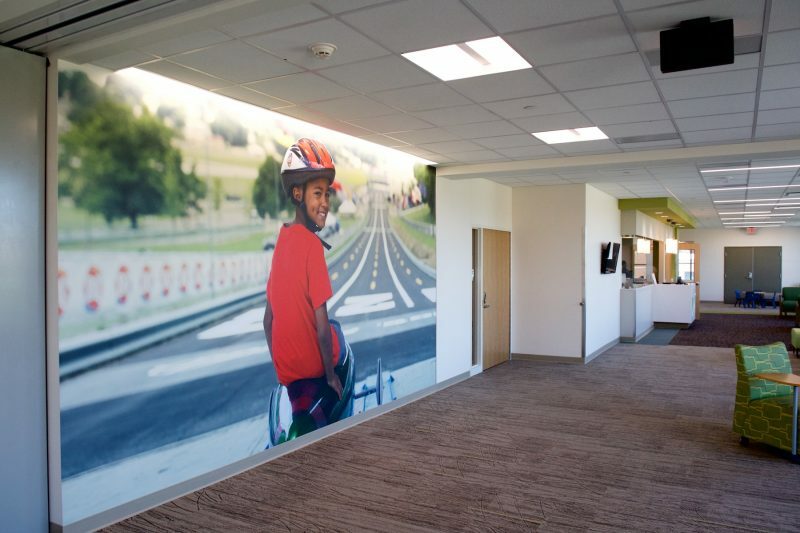 All the children featured in the large wall murals are local residents, and most are Akron Children’s patients. This homage pays tribute to a few Doggie Brigade members we’ve lost and a few we love (left to right): Faith, Hannah, Moose, Dakota and Karmie. 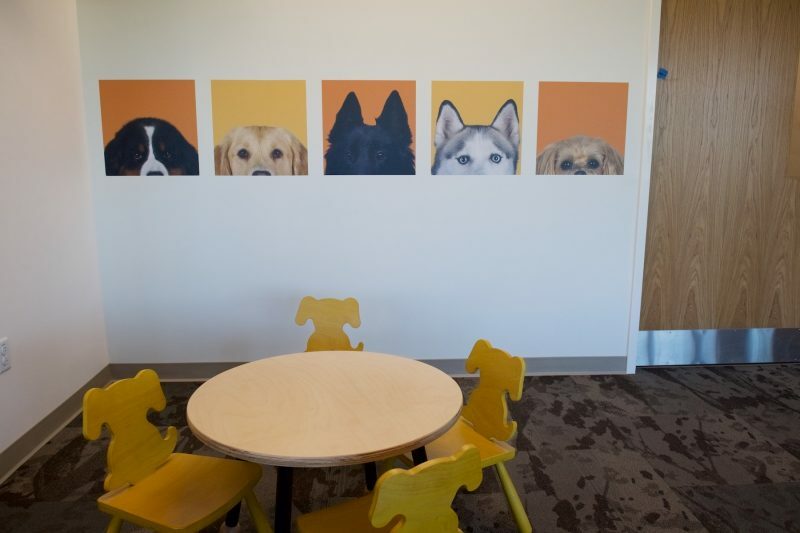 The space on Level 3 is complete with doggie chairs for our littlest patients coming to Locust Pediatric Care Group. Many of the framed photos throughout the public spaces were taken by in-house photographers Ted Stevens and Tiffany Swift. 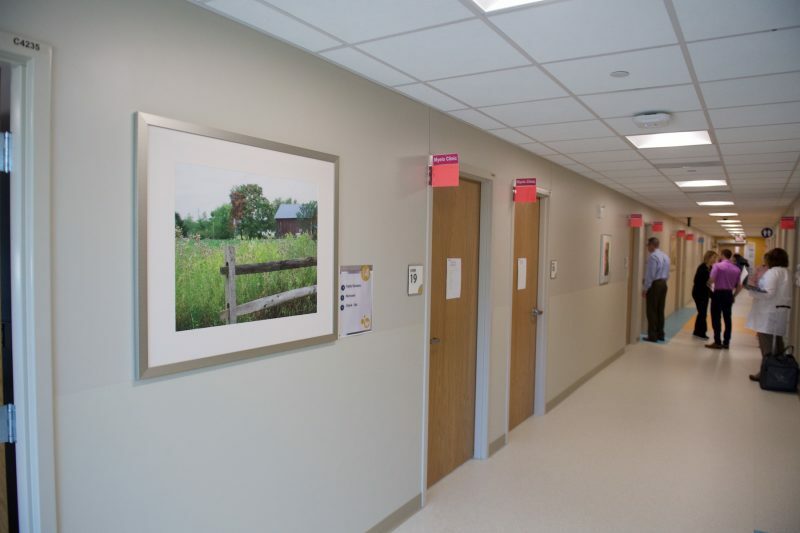 A patient care area in NeuroDevelopmental Science Center on Level 4. 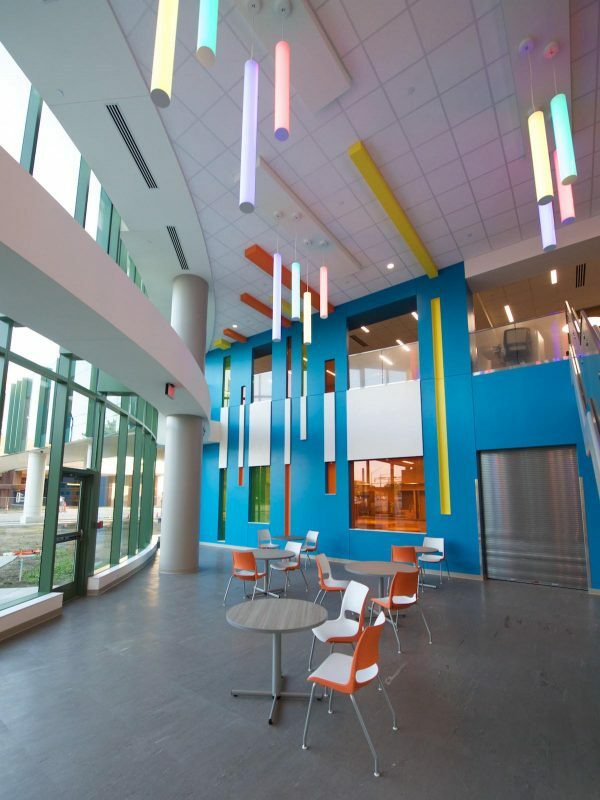 Facilities Architect Brian Lapolla said the building’s amenities were designed to be family-friendly and accessible. Self-check-in kiosks on Levels 2 and 3 are height adjustable and wheelchair accessible. For breastfeeding mothers, lactation rooms are available on Levels 2 and 4 with hospital-grade breast pumps and pumping kits. Moms are also welcome to bring their own pumps. Level 2 will offer valet parking in the turn-around and a bistro featuring Starbucks coffee, grab-and-go food items and custom-made smoothies. Outside the Garden Patch Bistro, which will open Oct. 29. Level 3 will offer connector bridges to both the Bowery Parking Deck and the main hospital. 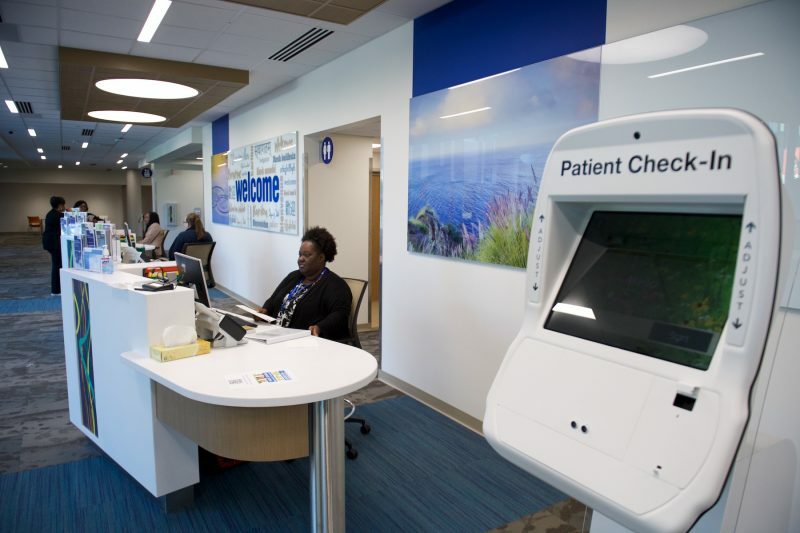 The third floor will also house an outpatient pharmacy open Monday through Friday from 8 a.m. to 5 p.m. and a walk-in, full-service laboratory with hours from 7 a.m. to 6 p.m. on weekdays and 8 a.m. to 1 p.m. on weekends. “All floors in the building will have handicap accessible restrooms as well as adult sized changing tables,” said Brian. 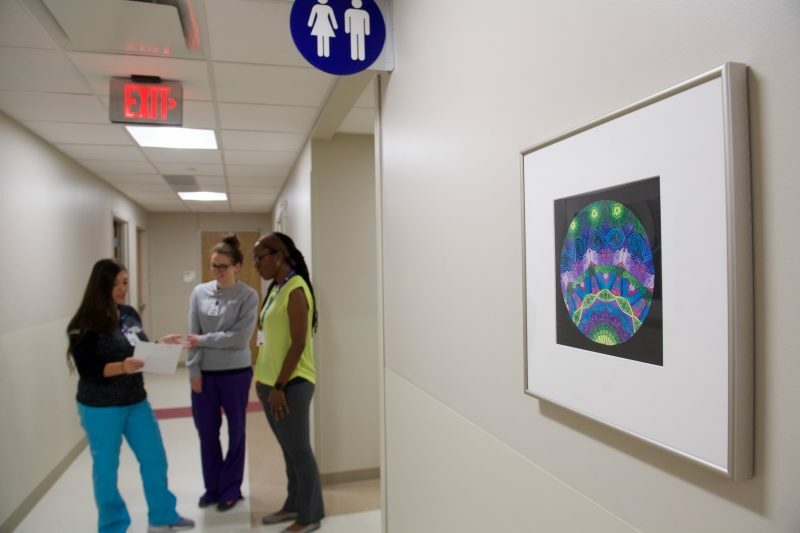 Families can also appreciate the building’s carefully curated art by local school children which was hand-picked by Ron Beahn, a local art contractor who works with the hospital. 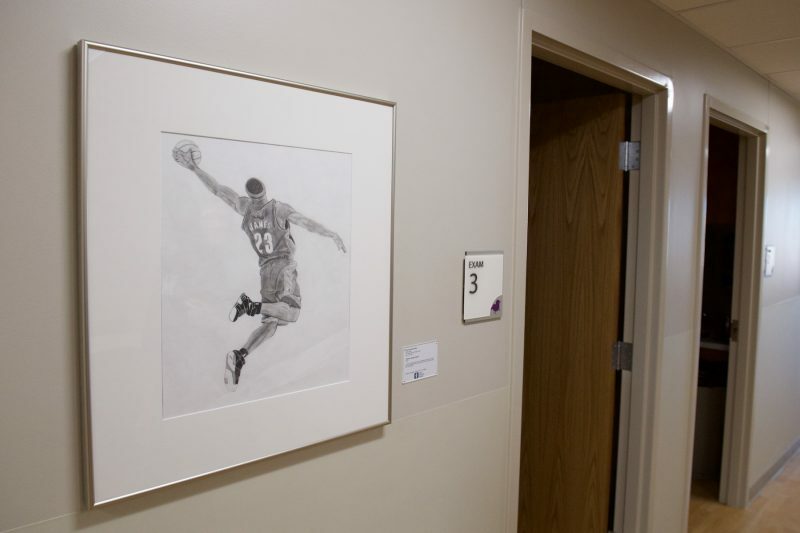 This pencil drawing by Dan Olszewski, 18, from St. Vincent-St. Mary HIgh School, features NBA player and Akronite LeBron James and adorns the wall in the new Sports Rehab office on Level 7. Ron says the 304 new pieces he has collected will be located in hallways, exam rooms and waiting areas where patients are served. “Each piece is framed and matted and has a nameplate to identify the student’s age, school and name,” he said. Artwork by student Sophia Gage, 14, of Stow-Monroe Falls High School hangs in the hallway of the Gastroenterology office on Level 6. Outside the building on the corner of Bowery and Exchange will stand a stainless steel, triple helix sculpture which will weigh 1 ton and stand approximately 18 feet tall. It is being designed by local metal sculpture artist John Comunale, who has done other pieces for the hospital. John sees his triple helix sculpture as a metaphor for passing his love of art onto future generations of people. Although John is the one who came up with the design, Brian says the triple helix reminds him of the 3 promises the hospital was founded on.